An effective mindfulness practice for working with self-stories so you don’t get so caught up in yourself that you miss the irreplaceable moments happening right in front of you. To feel unworthy is to suffer. It feels like you’re flawed and must conceal your faultiness from others or risk being shunned. But concealing, pretending, and holding yourself apart from others tends to make you feel alienated and then interpret these feelings as proof that you’re flawed. This is a vicious cycle of self-doubts and self-judgments that separates you from others and prevents you from feeling whole and complete. Though you may be stuck in this self-concept, it’s far more arbitrary and malleable than you may think. Mindfulness and self-compassion allow you to see and acknowledge the tenderness and pain in your story without falling under the delusion that the story defines who you are. It may be your story, but it isn’t you. An effective way of working with self-stories is summed up in the acronym AWARE, which stands for allow, witness, acknowledge, release, and ease up. Allow all of your thoughts and feelings to come and go as they will. This will help you soften your reactions to whatever comes up for you in the space of mindful awareness. Allowing is a kind and curious attitude that enables you to look more deeply into your stories and learn from them rather than becoming entranced by them or trying to block them, both of which will just leave you more stuck. By allowing your experience in this way, you can learn to accept all thoughts as vehicles for insight rather than as proof of anything, including any inherent unworthiness or inadequacy. Allowing enables you to recognize that a thought is just a thought, whether you like it or not. Witness the narrative with which you construct your sense of self. Sometimes you’re the one who has acted: “I did…” “I should have…” “I shouldn’t have…” “I wish I could have…” Sometimes you’re the one who has been acted upon: “Somebody did this or that to me.” “Everyone ignored me.” “People always…” “No one ever…” Either way, it drones on and on as long as you indulge it. From the perspective of mindful awareness, you can witness the habitual ways your mind creates the narrative-based self without identifying with them. Witnessing is curious and nonjudging. It doesn’t cling to or avoid anything. With this tool you can look more deeply into even very painful events with your heart wide open. Just as an emergency room physician looks deep into a wound without flinching and finds the shard at its core, you may discover things you no longer need to carry or blame yourself for. When you use allowing, witnessing, and acknowledging to see the storyteller at work, you can finally stop identifying with the self created by your stories. You don’t have to believe everything you think. Why stay in a prison of self when the door is wide open? Let everything go. Let everything be. Acknowledge what you experience happening in stories you tell about yourself. Practice sitting quietly and observing whatever arises. Note the physical sensations, thoughts, and emotions you experience as they come and go. Use simple phrases to acknowledge your experience, such as “worrying,” “planning,” “thinking,” and so on. Is there a character you are attempting to create or assassinate? Notice any repetitive or habitual elements through which you create the narrative-based self. Is there a theme? Is the storyteller cruel or kind, brilliant or blind? Are there familiar judgments? Are there familiar longings? Acknowledge all that you notice. Release the self-concepts that you’ve fabricated with these old stories and concepts. Disidentify from your habitual and familiar ways of thinking of yourself. Fame, shame, loss, gain, pleasure, and pain are all transient experiences, not attributes of self. When you use allowing, witnessing, and acknowledging to see the storyteller at work, you can finally stop identifying with the self created by your stories. You don’t have to believe everything you think. Why stay in a prison of self when the door is wide open? Let everything go. Let everything be. Ease up and emerge from this trance of unworthiness. When you’re stuck in a self-concept of inadequacy and unworthiness, a great deal of your self-talk involves comments about how you’re doing, looking, or performing, and so much of this internal dialogue calls forth comparisons to others and judgments about yourself. This is neither necessary nor skillful, and it’s never any fun. Everything isn’t about you. Plus, when you’re caught up in thoughts about yourself, you’re missing what’s actually happening in each irreplaceable moment of your life. 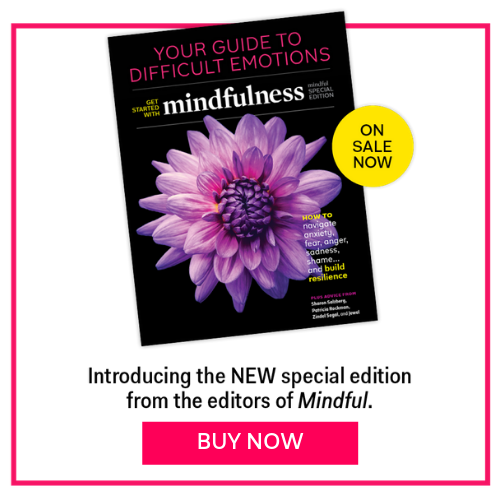 Allowing, witnessing, acknowledging, releasing, and easing up are primary skills in meditation practice and will also serve you well in the unfolding moments of your life—at work, at home, with friends, and in everything you do, particularly when you notice that your self-talk has become critical and unkind. The AWARE practice can become a way of life that helps you grow a little freer each time you practice it. This article was adapted from Dr. Bob Stahl’s and Steve Flowers’ book, Living with Your Heart Wide Open. Steve Flowers is the director of the Mindfulness-Based Stress Reduction Clinic in Chico, CA. He is the author of The Mindful Path through Shyness: How Mindfulness and Compassion Can Help Free You from Social Anxiety, Fear, and Avoidance.